Not all cooling towers are the same. While they may look similar from the outside, the inside tells a different story. 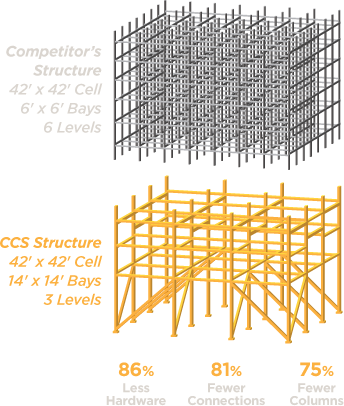 At CCS, we have designed a tower structure that is unlike any other on the market – providing real and lasting advantages for our customers. It starts at the most fundamental level with our superior raw materials and custom-manufactured components. Each tower is engineered to the customer's specific requirements using our flexible, open-frame tower design that requires fewer columns and connections. This enables faster and safer project execution, and ultimately results in lower operating and maintenance costs over the extended life of the tower. And all of this is delivered by CCS, a highly qualified and experienced partner that you can count on for years to come. We custom manufacture our FRP material using a special glass lay-up and higher glass content with no fillers in our resin for increased tensile strength and shear resistance. Our resin coating is 2-4x thicker than our competitors' standard resin, making our towers better able to withstand the elements, including extreme temperatures and sun damage. CCS does not rely on "off-the-shelf" shapes. 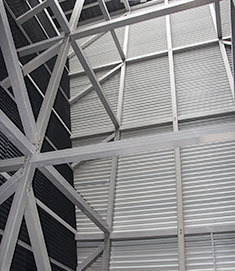 Our components are designed, engineered and tested specifically for cooling tower use. 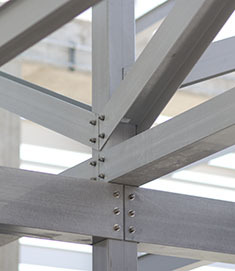 Our patented two- and three-bolt structural connections are stable without spacers or torquing, and we anchor every column to the basin. Our Multi-Flo™ distribution system allows the number, location and capacity of spray nozzles to be optimized to match tower dimensions and performance requirements. With Multi-Flo, turndown capabilities can be as low as 30-50% of total capacity for efficient tower operation through a wider range of load conditions. CCS' ThermaFit software is a powerful cooling tower sizing and selection tool that helps engineers and CCS representatives design and select the optimal tower design for the application from a range of possibilities. This saves valuable design time up front, matching size and performance requirements without being restricted by other manufacturers' "standard product" limitations. We developed a proprietary software system to automate structural design and bill of materials, enabling industry-leading delivery time of materials to site. Only CCS uses 6 x 6-inch "power columns" that can be spaced at any increment up to 14 feet apart. That means our towers can be matched to the exact space available for improved efficiency and lower energy costs. With larger columns and spacing, our structure requires 75-85% fewer columns, connections and hardware pieces than other providers' towers - significantly reducing the training and installation hours needed. Our lean assembly processes include pre-packaged/marked components and standardized hardware to eliminate guesswork and lower risk by reducing overall time on site. Our stable, open-frame design allows the crew to tie-off anywhere on the structure and provides room in the basin to maneuver scissor lifts rather than working from ladders and scaffolding, increasing safety. 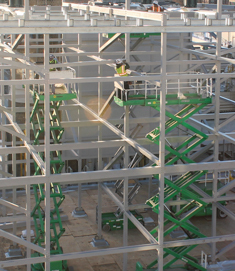 Our exclusive FRP tower structure and streamlined build process typically equate to a 35% reduction in labor hours, so we can invest more of your budget into the high-quality materials that stay on site and create return value. Because our towers can be built to the exact footprint available, we are able to utilize the optimal motor size and lowest horsepower possible to increase efficiency and reduce utility bills. CCS' FM 4930 Approved cooling towers are the only ones on the market that incorporate all FRP material, including the basin, using our standard structure and components. We were the first company to obtain FM 4930 Approval without a sprinkler system, eliminating the associated installation and ongoing maintenance expenses. The open-frame design of our towers allows easy access to the basin, making it faster and less costly to clean and inspect. Exclusive tower features like our patented connections with no annual torque requirements and our thicker, longer-lasting UV coating yield on-going maintenance savings. CCS composite cooling towers are engineered for a minimum structural design life of 50 years, ensuring that your investment will pay off for years to come before a replacement is needed. From our founding leaders who developed the first fiberglass tower in 1981 to the construction of North America's largest crossflow FRP tower in 2010, CCS has more FRP cooling tower experience than any other provider. When you work with CCS, you benefit from the extensive knowledge and ingenuity of our people across all functions - from our engineers and sales team to our project managers and local representatives. As a custom cooling tower provider, we work with each customer individually to design the best solution to fit the requirements. CCS provides responsive service and follow-up on initial inquiries and submittals, during project execution and for any post-installation issues. We have a solid reputation in the industry for delivering on our promises and producing quality results. More than just a vendor, we are a partner who stands behind the quality of our products and forms lasting relationships with our customers. In fact, 80% of them come back to buy from CCS again.